A joint study by researchers from Nanyang Technological University, Singapore (NTU Singapore) and clinicians at Tan Tock Seng Hospital (TTSH) has yielded insights into how doctors can better communicate the value of clinical investigations to patients. The research team is one of the first groups in Singapore to use Conversation Analysis, a method for studying social interaction, in a hospital setting. In Conversation Analysis, video recordings of interactions in an authentic setting are transcribed verbatim. Researchers analyse the verbal and non-verbal aspects during each person’s turn to talk, paying attention to context and identifying recurring patterns of interaction. This micro-analysis is richer in insights compared to retrospective interviews and surveys commonly used in health communication studies. Researchers can subsequently give clinicians specific recommendations in terms of what to say, and how to say it at a specific point, in order to enhance the communication process. For example, when addressing a patient’s concern about pain during a procedure, just explaining the use of anaesthetics may not be enough to reduce the fear. Instead, the doctor can share what his past patients said about their experience. The research outcomes are expected to shape the design of medical communication modules for training of future urologists in TTSH. 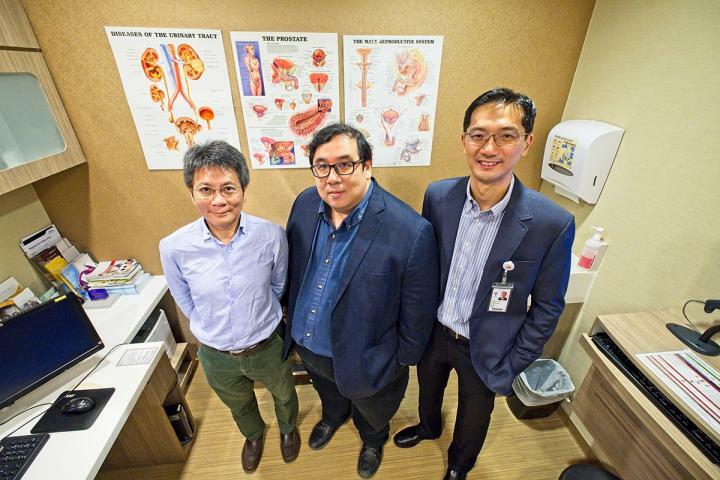 The study which involved an analysis of 150 doctor-patient conversations at TTSH’s Urology clinics was led by Professor Luke Kang Kwong Kapathy and Assistant Professor Lim Ni Eng, both from NTU School of Humanities, in collaboration with Adjunct Assistant Professor Png Keng Siang, Senior Consultant, Department of Urology, TTSH. “Conversation Analysis is a fresh look into communication in healthcare which doctors were not previously exposed to. We are excited that our day-to-day doctor-patient interactions can shed so much insight through the use of this novel approach,” said Adjunct Asst Prof Png Keng Siang. “Current medical education already includes communication training, but we want to go a step further in looking at the actual interactions in the clinics. Studying the languages, responses and social psychology in the clinical setting gives us insights on what makes patients more receptive to doctors’ recommendations, which may lead to patients being more willing to go through necessary tests and increased patient satisfaction,” said Prof Luke, who is the Chair, School of Humanities, and Associate Dean (Research), College of Humanities, Arts, & Social Sciences at NTU. The study involved filming 150 first-visit consultations at TTSH urology clinics. A preliminary study involving 50 patients and three urology consultants started in July 2016. From the initial findings, a larger study involving 100 patients and clinicians from the urology department was conducted from mid-2017 to mid-2018. Patients had given their written consent to participate in this research project, which was approved by National Healthcare Group’s ethics review board. A common reason for patients to be referred to Urology clinics is the presence of blood in urine. As this can be caused by various reasons, a first-visit consultation often involves the recommendation of various diagnostic procedures, in order to pinpoint the exact cause behind the symptom. These tests may consist of a urine test, renal ultrasound, as well as cystoscopy which involves running a thin tube with lens to the bladder through the urethra. Recurring scenarios include patients’ expression of fear towards cystoscopy, and apprehension towards going through multiple tests. To enhance the communication process, doctors can be more aware of patients’ subconscious signs of fear. To patients who may view the tests as being optional, they can also explain upfront that all the tests are needed to pinpoint the exact cause behind the symptoms, before going into test details. Throughout 2018, the research team had presented their findings at several international conferences such as the Singapore Public Health & Occupational Medicine Conference, the International Symposium on Healthcare Communication, and the Global Health Histories Seminar jointly organised by the World Health Organisation and Sri Lanka’s government. NTU and Tan Tock Seng Hospital have been collaborating in advancing patient care through their engagement in the Lee Kong Chian School of Medicine and Health City Novena. The NTU team is part of a medical humanities research cluster at the university, which looks at the linguistic, social and cultural aspects of medical practice. Other ongoing projects by the same team include enhancing communication in TTSH’s Ophthalmology clinics and in the training of medical students. The researchers also aim to apply Conversation Analysis in palliative care in future. More information is available at http://www.ttsh.com.sg.